Pakistani Taliban militants stormed a prison in northwest Pakistan early Sunday and freed 390 prisoners, including 20 militants, local officials said. The attack occurred about 2:30 a.m. at a prison in Bannu. The town is considered the gateway to North Waziristan, a tribal region along the Afghan border that has long been a stronghold for Taliban insurgents and several other militant groups. Local police officials said as many as 200 Taliban militants drove up in pickups, lobbing hand grenades to break through the jail’s main gate. Once inside, a two-hour firefight broke out between the attackers and roughly 30 jail guards. The militants began freeing prisoners after the guards ran out of ammunition, officials said. No one was seriously injured or killed in the attack. One of the prisoners freed was Adnan Rashid, on death row for an assassination attempt on former Pakistani leader Pervez Musharraf when the general was president, police said. Officials said the jail’s 944 prisoners, including some militant commanders, recently had been moved to the Bannu jail after authorities received intelligence that Taliban militants might be planning major raids on detention centers holding insurgents. In recent years, Pakistan has sent more than 140,000 troops to battle the Pakistani Taliban across much of the tribal region along the Afghan border. The army has retaken large stretches of territory, but the militants still cling to pockets of resistance throughout the tribal belt and continue to carry out periodic attacks on a variety of targets, including military checkpoints, mosques and markets. 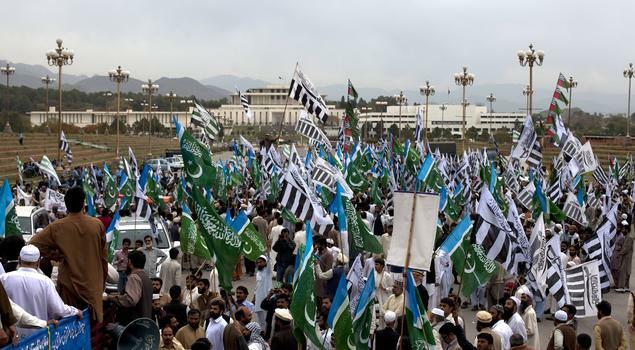 Like the Afghan Taliban, the Pakistani movement is made up of factions united by the goal of toppling the government and imposing Sharia, or Islamic law. It maintains links with Al Qaeda, the Afghan Taliban and other Pakistani militant groups ensconced in Pakistan’s tribal belt. 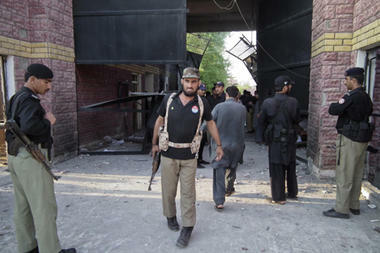 Authorities in Islamabad, the capital, have blamed the Pakistani Taliban for some of the country’s worst terrorist attacks, including the assassination of former Prime Minister Benazir Bhutto in December 2007. Pakistan’s parliament on Thursday unanimously approved new guidelines for the country in its troubled relationship with the United States, a decision that could pave the way for the reopening of supply lines to NATO troops in neighboring Afghanistan. The guidelines allow for the blockade on U.S. and NATO supplies to be lifted, but also call for an immediate end to American drone strikes against militants on Pakistani soil. However, the lawmakers did not make a halt in the CIA-led missile attacks a prerequisite to reopening the supply lines, as some lawmakers had been demanding. The government and the army will use the recommendations as the basis for re-engaging with Washington. Ties between the U.S. and Pakistan all but collapsed in November after U.S. airstrikes inadvertently killed 24 Pakistani soldiers on the Afghan border, after which Islamabad blocked the supply lines in protest. Washington wants the relationship back on track. About 30 percent of supplies used by NATO and U.S. troops in landlocked Afghanistan are transported through Pakistan. Washington also needs Islamabad’s cooperation to negotiate an end to the Afghan war because many insurgent leaders are based on Pakistani soil. The drones are a source of popular outrage in the country and have fueled anti-U.S. sentiment, although Pakistan’s powerful army has tacitly aided the missile attacks in the past, weakening Islamabad’s official stance that they are a violation of sovereignty. Washington has ignored previous entreaties by the parliament to end the strikes, and is seen as unlikely to change its policy now. Despite calls by Islamists for a permanent supply line blockade, few inside the Pakistani government or the army believed this was desirable, given that Pakistan relies on the U.S. and other NATO countries for its economic survival and diplomatic and military support. Soon after the deadly airstrikes on the border, the Pakistani government called on parliament to draw up new guidelines for Islamabad’s relations with the U.S. The government’s move was widely seen as way to give it political cover for reopening the routes. The national security committee presented a first set of proposals last month but opposition parties riding a wave of anti-American sentiment rejected them, seemingly unwilling to share any fallout ahead of elections this year or early next. But on Thursday the opposition voted with government lawmakers to approve a revised set of guidelines, which differed little from the original ones. Opposition lawmakers didn’t explain why they had dropped earlier objections, but they could have come under pressure from the army or extracted other, unrelated concessions from the government. The guidelines call for NATO and the U.S. to pay Pakistan more for the right to ship supplies across its soil and stipulate that no arms or ammunitions be transported. Western forces have only ever trucked fuel and other nonfatal supplies across Pakistan because of the risk they could fall into the hands of insurgents. “We believe that the world has heard the voice of the people of Pakistan,” Prime Minister Yousuf Raza Gilani told parliament. “I would like to assure the house that our government will implement the recommendations that have been made in both letter and spirit.” Gilani did not say when the supply lines would reopen. Western officials have said Pakistan would come under intense criticism if routes remained blocked during a NATO conference in Chicago on May 20-21 where more than 50 heads of state will discuss progress on ending the war. Washington’s public line has been that it is waiting for the parliament to finish its review before calling for Pakistan to reopen the routes. It has refused to apologize for the border incident in November, and last week put a $10 million bounty on the head of a militant leader believed close to Pakistan’s security forces. Behind the scenes, however, negotiations have been going on between the U.S. and Pakistan over the supply line issue and drone strikes. It was unclear whether there has been any new agreement on the strikes, which Washington believes are key to keeping al-Qaida on its back foot. U.S. officials had said they had offered Pakistan notice about impending strikes and new limits on which militants are being targeted. For most of the Afghan war, 90 percent of the supplies came through Pakistan, but NATO has increased its reliance on an alternate, so-called “northern” route, through Central Asia in recent years. Increased use of the northern route has removed some of the leverage Islamabad had over the West, but at a cost to the coalition. Pentagon officials now say it costs about $17,000 per container to go through the north, compared with about $7,000 per container to go through Pakistan. Afghanistan’s rural Ghazni Province usually appears on the news radar only to herald a tragedy: Five Polish soldiers were killed by a roadside bomb days before Christmas. A group of armed men accused a widow and her daughter of adultery in November and stoned the pair before shooting them in front of their home. In other words, it’s not the sort of place you’d expect to find a hobbyist aviator in his backyard building what he describes as the first airplane ever designed and constructed in Afghanistan. 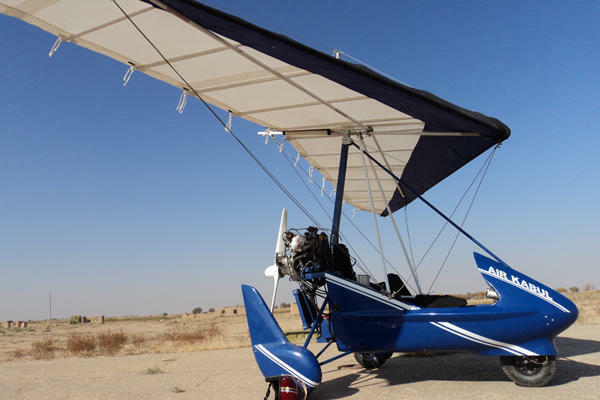 Yet, over the past three years Ghazni-native Sabir Shah managed to fashion a one-man “microlight,” aircraft at his family home using instructions from the Internet and parts from the local market. While impressive compared with a Wright Brothers’ creation, the plane is far from a marvel of modern aviation. But Mr. Shah hopes it’s enough to inspire government support or private investment in Afghan aviation. So far though, aside from modest, but passing interest from a few government officials, he’s received little attention. Most Afghans, including his own family, have called him crazy and told him to get a regular job. Still, Shah remains determined to create a business building airplanes for Afghanistan. “I believe that if you want something, you can get it,” he says. Shah is an unlikely candidate to be Afghanistan’s aviation advocate. A high school graduate with no pilot training nor aeronautical engineering background, he’d never even traveled by airplane when he started building one. For Afghans wishing to learn how to fly, the options are extremely limited. The country has a fledging air force, but there are no other practical opportunities for pilot training. The Ministry of Transportation and Aviation offers flight classes, but ministry officials admit that few students actually take the courses because Afghan airlines almost exclusively hire foreign pilots with better training and more experience. After high school, Shah considered going on to college. Yet even though public universities are free, his family couldn’t afford losing the extra pair of hands. Given his circumstances it’s easy to understand why people were skeptical when Shah announced his plans to build a microlight airplane after seeing one featured on a documentary and doing a bit of Internet research. Undeterred, Shah continued his research and worked a series of odd jobs to save up money for parts and equipment. As he progressed, friends and family donated money. An uncle in Australia gave him a vital $2,000 donation and even Afghan Vice President Abdul Karim Khalili contributed $1,000 when he learned of the project. After three years, Shah had constructed a microlight airplane using a propeller he made himself, a small Toyota car engine, a homemade fiberglass body, a wing made of a metal frame and cloth, and some spare gauges he bought at the market for his instrument panel. The project cost Shah a total of $12,000, a small fortune here. When it came time for his first test flight, the Afghan Ministry of Defense agreed to use a military helicopter to transport Shah and his plane to an airfield north of Kabul. The trip was the first time Shah had ever traveled by air. “I was frightened a little when I was looking down,” he says, recalling the trip. Before Shah climbed into the pilot seat, a retired Afghan pilot who’d flown jets for the Soviets and now managed the airport gave him a few pointers. Otherwise, he was relying on manuals he’d collected on other microlight aircraft. As his plane sped down the runway, his fear momentarily faded. The flight lasted less than a minute before he set it down on the runway again. In a total of four takeoffs, his longest and last flight traveled about a quarter of a mile – nothing compared with professional tests, but 11 times farther than the original Wright Brothers’ flight. However, that final flight ended when he crash-landed just off the runway. Though he walked away from the crash, the plane was damaged beyond repair. Considering that it’s been 64 years since a pilot first broke the sound barrier and 25 years since a plane circumnavigated the globe without stopping or refueling, Shah’s achievement may seem hardly worth mentioning. But his accomplishment is much less about the actual plane he built and more about his creativity and inventiveness in a country where innovation and ingenuity are in short supply after three decades of war. Despite the challenges, Shah says he’ll keep working. If he can find a scholarship to study abroad he will, but he doesn’t know how to look for such an opportunity and doubts it will happen. For now, he hopes his initial success will attract investors as he endeavors to start his next project, an eight- to 10-seater airplane that he hopes can be used for domestic travel in Afghanistan. One of Pakistan’s most notorious extremists mocked the United States during a defiant media conference close to the country’s military headquarters Wednesday, a day after the US slapped a $10 million bounty on him. Analysts have said Pakistan is unlikely to arrest Saeed, founder of the militant group Lashkar-e-Taiba, because of his alleged links with the country’s intelligence agency and the political danger of doing Washington’s bidding in a country where anti-American sentiment is rampant. Saeed, 61, has been accused of orchestrating the 2008 attacks in the Indian city of Mumbai that killed 166 people, including six American citizens. But he operates openly in Pakistan, giving public speeches and appearing on TV talk shows. He has used his high-profile status in recent months to lead a protest movement against US drone strikes and the resumption of NATO supplies for troops in Afghanistan sent through Pakistan. The supplies were suspended in November in retaliation for American airstrikes that accidentally killed 24 Pakistani soldiers. Hours before Saeed spoke, US Deputy Secretary of State Thomas Nides met Pakistani Foreign Minister Hina Rabbani Khar in the nearby capital, Islamabad, for talks about rebuilding the two nation’s relationship. In a brief statement, Nides did not mention the bounty offer but reaffirmed America’s commitment to “work through” the challenges bedeviling ties. The US said Tuesday it issued the bounty for information leading to Saeed’s arrest and conviction in response to his increasingly “brazen” appearances. It also offered up to $2 million for Lashkar-e-Taiba’s deputy leader, Hafiz Abdul Rahman Makki, who is Saeed’s brother-in-law. The rewards marked a shift in the long-standing US calculation that going after the leadership of an organization used as a proxy by the Pakistani military against archenemy India would cause too much friction with the Pakistani government. This shift has occurred as the US-Pakistani relationship steadily deteriorated over the last year, and as the perception of Lashkar-e-Taiba’s potential threat to the West increased. The US may be hoping the bounty will force Pakistan to curb Saeed’s activities, even if it isn’t willing to arrest him. But the press conference he called at a hotel in the garrison city of Rawalpindi on Wednesday was an indication that is unlikely, and the bounty may even help him by boosting his visibility. At the hotel, located near the Pakistani army’s main base and only a half hour drive from the US Embassy in Islamabad, Saeed was flanked by more than a dozen right-wing politicians and hardline Islamists who make up the leadership of the Difa-e-Pakistan, or Defense of Pakistan, Council. The group has held a series of large demonstrations against the US and India in recent months. Some in the media have speculated the movement has the tacit support of the Pakistani military, possibly to put pressure on Washington. 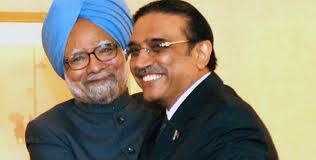 He denied involvement in the Mumbai attacks and said he had been exonerated by Pakistani courts. Pakistan kept Saeed under house arrest for several months after the attacks but released him after he challenged his detention in court. It has also resisted Indian demands to do more, saying there isn’t sufficient evidence. The bounty offers could complicate US efforts to get the NATO supply line reopened. Pakistan’s parliament is currently debating a revised framework for ties with the US that Washington hopes will get supplies moving again. But the bounties could be seen by lawmakers and the country’s powerful army as a provocation and an attempt to gain favor with India. Saeed founded Lashkar-e-Taiba in the 1980s allegedly with ISI support to pressure India over the disputed territory of Kashmir. The two countries have fought three major wars since they were carved out of the British empire in 1947, two of them over Kashmir. Pakistan banned the group in 2002 under US pressure, but it operates with relative freedom under the name of its social welfare wing Jamaat-ud-Dawwa — even doing charity work using government money. * Associated Press writer Asif Shahzad contributed to this report from Islamabad. It’s an ornate but not lavish two-story house tucked away at the end of a mud clogged street. 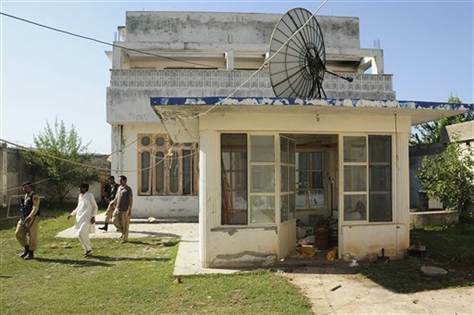 This is where Pakistan’s intelligence agency believes Osama bin Laden lived for nearly a year until he moved into the villa in which he was eventually killed. The residence in the frontier town of Haripur was one of five safe houses used by the slain Al Qaeda leader while on the run in Pakistan according to information revealed by his youngest wife, who has been detained. Al-Sada, a 30-year-old Yemeni, has been in Pakistani custody since May 2 when US Navy SEALs overran the Abbottabad compound, killing bin Laden and four other people inside. Since then, Pakistan’s intelligence agency, known as the ISI, has been trying to uncover the trail that brought him to Abbottabad villa in the summer of 2005. The best information appears to have come from al-Sada, who was believed to be his favorite and who traveled with bin Laden since his escape from Afghanistan’s eastern Tora Bora mountain range in 2001. Qadir, a 35-year army veteran who is now a security consultant, was given rare access to transcripts of Pakistani intelligence’s interrogation of al-Sada and access to other documents on bin-Laden’s movements. He provided the AP with details in a recent interview. The details of bin Laden’s life as a fugitive — which were first published by the Pakistani newspaper Dawn — raise fresh questions over how bin Laden was able to remain undetected for so long in Pakistan after the Sept. 11, 2001 attacks, despite being the subject of a massive international manhunt. According to the interrogation report, bin Laden lived in five safe houses and fathered four children — the two youngest born in a public hospital in Abbotabad. But investigators have only located the houses in Abbottabad and Haripur. Al-Sada’s descriptions of the homes have been vague and the Haripur house was found only after a series of hits and misses. She knew only that it was located on the edge of Haripur, it was two stories and it had a basement. It apparently was used by bin Laden while he waited for construction crews to finish his new home Abbottabad, a garrison town just 20 miles away. Investigators scoured the area looking for properties until they found the Haripur house in Naseem Town, a chaotic suburb where relatively affluent houses bump up against sun-baked mud huts that belong to nomadic Afghans. Like the CIA, the Pakistani agency also tracked the movements of bin Laden’s Pakistani courier who used the pseudonym Abu Ahmed al-Kuwaiti and his brother. The two were ethnic Pashtuns from Pakistan’s Khyber Pukhtunkhwa province on the border with Afghanistan. They were bin Laden’s front men. The ISI discovered that the Haripur house, like the land on which bin Laden’s Abbottabad villa was built, was rented by two Pashtun brothers claiming to be from Charsadda, a Pashtun dominated town about 80 miles away. The AP located the Haripur house that Qadir said ISI agents had taken him to last November and found the real estate broker, Pir Mohammed, who rented the four-bedroom house to the two brothers, Salim and Javed Khan from Charsadda, for $150 a month. At the time Pir Mohammed ran a small real estate firm called Mashallah. He said his meeting with the brothers was random. “They must have seen my sign and come in,” Mohammed said, adding that he had met the brothers only three times — when they signed the contract, when they moved into the house, and when they moved out 11 months later. Two months ago several ISI agents took all the records of the house and its tenants since its construction in 2000, said Qasi Anis Rahman, the brother of the widow who owns the house. “All they said was that it was for ‘security purposes,'” said Rahman. Al-Sada is currently in Pakistani custody, along with bin Laden’s two other wives and several children. They were arrested after the raid. The US Navy SEALs shot al-Sada in the leg during the operation. Mohammed Amir Khalil, a lawyer for the three widows, said the women would be formally charged for illegally staying in Pakistan on April 2. That charge carries a maximum five-year prison sentence. A Pakistani parliamentary committee — tasked with laying out new terms of engagement with the United States and NATO — on Tuesday demanded an end to U.S. drone strikes and an apology from Washington for a NATO strike last year that mistakenly killed 24 Pakistani troops. The report, read to a joint session of both houses of parliament by committee chairman Mian Raza Rabbani, calls on the United States to review its activities and cease all drone attacks inside Pakistan. U.S. lawmakers, however, are rejecting those calls. Independent Senator Joe Lieberman told VOA the drone strikes are critically important to America’s national security, adding he does not believe they should stop. Democratic Senator Dianne Feinstein, chairwoman of the Senate Intelligence Committee, said the drones are needed due to the lack of a more aggressive effort by Pakistan to root out terrorists and radical militants along its border with Afghanistan. Washington has expressed regret for the loss of life and accepted partial responsibility for the airstrike, but has so far refused to apologize, saying NATO forces acted in self-defense. 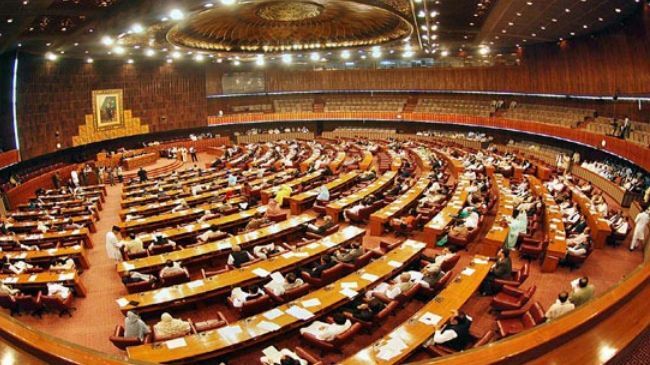 Pakistani lawmakers are expected to eventually approve the panel’s recommendations. But, ultimately, Pakistan’s government and powerful army have the final say in the U.S.-Pakistani relationship. U.S. State Department spokeswoman Victoria Nuland Tuesday said she would not comment on the issue until the process is completed. Pakistani Foreign Minister Hina Rabbani Khar told reporters outside of Parliament that Pakistan needs to balance good diplomatic relations with its own interests.